Spring – Girls Soccer, Boys Baseball, Boys Club Lacrosse, and Co-Ed Club Golf. Once tryouts take place and teams are formed for each sport, we play all other members in our league twice for a total of 14 games (home and away). We do have league tournaments for all sports and currently participate in invitational tournaments for volleyball and basketball. Our success during the regular season determines our involvement in tournament and final round games, leading to the championship. Based on numbers when needed, we do have a tryout process for making the sports teams. Tryouts will take place over 3 days and teams will be determined based on many factors, from coachability/attitude to skill level. Since we are supporting and encouraging “Student-Athletes,” grades and conduct also affect decisions during tryouts, as well as throughout the season, to maintain eligibility requirements. 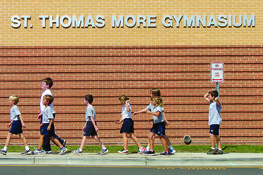 All players and parents must read, understand, and sign our Athletics Policy, also found at http://school.st-thomasmore.org/athletics in order to participate. Upon making a team, there is an athletic fee of $80.00 per player, per sport, which will be billed to your FACTS account. This helps with the overhead costs for the program to operate. As we now begin to play. Please guide us all to do our best. We offer our talents in Your name.